Interspecies friendships are often adorable, but they're doubly sweet when those animals are providing one another with much needed support. 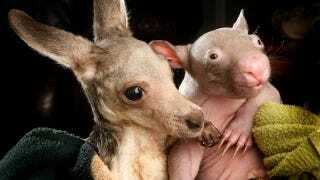 Orphaned kangaroo Anzac and orphaned wombat Peggy keep each other company at the Wild About Wildlife Rescue Centre in Kilmore, Victoria. All of the animals at Wild About Wildlife are cared for under veterinary supervision, and joeys are raised in a humidity crib until they are large enough to retain their own body heat. But the animals provide comfort to one another by curling up, reassured by each other's movement and heartbeats. Anzac especially enjoys spending his time with another joey, Poppy, as well as with Peggy. Wild About Wildlife explains on its Facebook page that Peggy has been at the shelter for just a few weeks and the carers are still looking for a partner for her. For now, though, she is happy to cuddle with her kangaroo pal. Photo from the Wild About Wildlife Facebook page. See more heart-melting cuteness at the Daily Mail.